After a controversial decision to pull The Hate U Give by Angie Thomas off the shelves at schools in the Katy (TX) Independent School District, the critically acclaimed novel about a black teen dealing with the aftermath of witnessing a police shooting that killed her unarmed friend was returned to the district's high school libraries on Thursday. "The book is back on shelves at all of our high schools, but it includes a parental consent - that can be given by a phone call, email or an in person consent by the parent," said Maria DiPetta, manager media relations for Katy ISD. 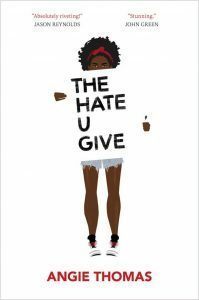 The Hate U Give, Thomas' debut novel, is the Boston Globe-Horn Book Award winner for fiction and a National Book Award Longlist and Morris Award Finalist title. The book's ultimate fate in the district is pending a committee review of the original challenge. After a parent complained about the book to the board of education in November, members of the board and superintendent Dr. Lance Hindt read the book, according to DiPetta. Hindt then made the decision to pull the book "because of the pervasive vulgarity," DiPetta said. Despite local district policy that requires a committee review before removing challenged material, Hindt had legal authority to make the decision and override that local policy, according to DiPetta. The Office for Intellectual Freedom of the American Library Association and others have argued that is not true. For their part, the Katy ISD administration said it is not true that the book was banned, as media reports and social media posts indicated. "It was just temporarily removed, it was not ever, ever banned," said DiPetta, noting that students were free to bring the book to school or use it for reports or homework. It could only be temporarily returned as well. It is back with parental consent pending the committee review to the original challenge. The committee, which can include librarians and teachers, has not yet been finalized. The process can take from a couple of days to months, according to DiPetta. People in the book community didn't wait for the district to correct the issue, instead quickly working through social media and connections to get the book to kids in Katy as quickly as possible. 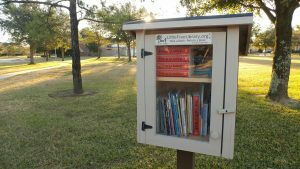 Stackedbooks.org sent out the call for donations of the book and people to deliver it to Little Free Libraries in the area. Katy Cronk and Breonna Brownlee were two who volunteered and, between them, had received about 100 books in less than a week. They loaded their cars with a portion of those deliveries over the weekend and deposited them in various Little Free Libraries. "It felt like it was doing some good for the community," said Cronk. "I think it's a really important book for what's going on in our world, as well as a great message about finding your voice." For Brownlee, it was the first step toward achieving her goal of being proactive this year instead of just tweeting about things that bother her. She has friends who live in the Katy district and says the response to this initiative was all positive. Cronk, on the other hand, encountered a mixed reaction. "It's really diverse down here," said Cronk. "It depends on whether you read the book and what you think it's about." The whole thing has made Brownlee think about her next step. "I would like to do something like for kids that don't have it so good," she said, describing Katy as an affluent area with large houses and gated communities. "As a Houstonian, I'd like to drop some books off like this in another area where it's their story. I know the book is about a girl that lives in a disadvantaged neighborhood but goes to a rich kids' school. I know that life. My mom lived that life here in Houston. I'd like to do something similar where they might not have Little Free Libraries, like a business or something near a school." Thank you for deciding to return the book to your shelves. As an 8th grade teacher, the situations in the book are real to life for my students and community. Maybe Katy ISD is different and more affluent, but the content in the book can create discussion and lead to teaching students diversity and tolerance. Thank you for putting this book back on the shelves of your library! I read this book and as an adult who has worked in a majority white school and in urban high schools, I feel this subject matter is so relevant to today and warrants an open and fair opportunity and discussion. There are some students who can only identify with this type of environment described in this book. I grew up in a neighborhood that wasn't as bad as "Garden Heights," but rough, nonetheless. After reading this book and posting about it on my blog, I felt frustrated, discouraged and hopeless, but I also felt hopeful. This books relates to someones reality and the story is one that needs to be told. Thank you again for keeping it on the shelves! I feel this subject matter is so relevant to today and warrants an open and fair opportunity and discussion. Let's hope the KATY independent school district really does put the highly relevant book back on their media center shelves. Intellectual freedom is a cornerstone of ALA's bill of rights. As a media specialist, it is part of our job to challenge those that try to censor books.